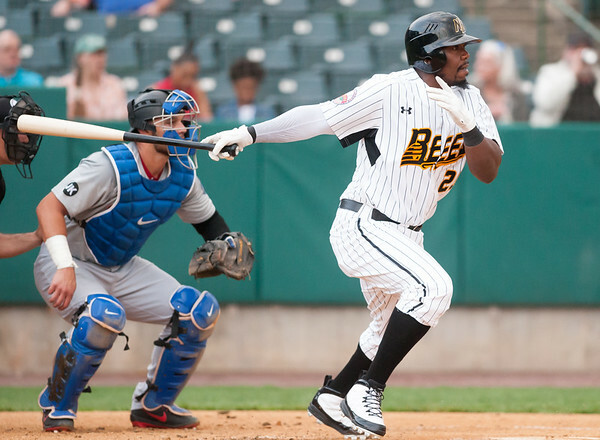 NEW BRITAIN - It doesn’t take much to see Jamar Walton has been one of the best hitters over the past two seasons for the New Britain Bees. After coming off a strong first season with New Britain last year, Walton has done much of the same in 2018. The outfielder is in the top-five on the team in average (.277), home runs (10), RBI (48), multi-hit games (22) and multi-RBI games (13). And for manager Wally Backman, having Walton’s big bat in the middle of the lineup has been key to the team’s offense. Walton believes his preparation, as much as his baseball ability, has been crucial to his production this season. But the Atlantic League all-star refused to take much of the credit, citing the production the other hitters in the lineup have had to propel the offensive success. Walton is also one of the few players on the team who have played under another manager with the Bees. Last season, Stan Cliburn was at the helm, who Walton said had a similar style to Backman. Another unexpected help for Walton has been playing at New Britain Stadium, which is a much easier place to play than some other Atlantic League parks, according to the player. As the Bees head into a playoff push in the final month of the regular season, the outfielder isn’t too concerened about his individual performance. For the 32-year-old, it’s all about the team. “Just help the team win,” Walton said of his goals for the end of the season. “If you help the team win, everything else will take care of itself. I try not to get too caught up in personal goals. You don’t want to get too high or too low. For me, it’s just all about the team. You know you’re not always going to hit, so whether it’s running a ball down in the outfield or throwing a guy out - somehow contributing to the win. Posted in New Britain Herald, New Britain on Friday, 24 August 2018 21:16. Updated: Friday, 24 August 2018 21:18.